The NANOTHERM project deals with the development, integration and manufacturability of advanced interface technologies for superior thermal and thermo-mechanical design for heterogeneously integrated power systems on different technology platforms for different market segments in industry. 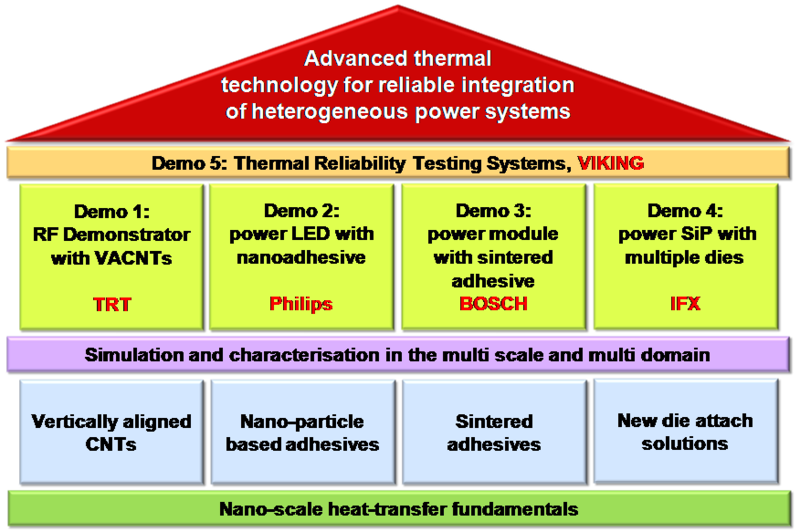 The NANOTHERM project will develop new high-performance interconnection and integration technologies for reliable integration of different advanced thermal technologies for industry demonstrators for different applications, in part harsh environment and high reliability. System performance will be increased by the technology advancement, the cost of power systems will be reduced by More-than-Moore. By nano-technology materials properties will be enhanced. The development will be supported by first class modelling, simulation and characterisation techniques from materials level to systems level. The Nanotherm project was kicked-off in September 2012 for a duration of three years. Please come back to visit for more achievements and news.